The Trade Federation blockade has really hurt the economy of the beloved planet Naboo, so sadly the royal fashion budget has to be cut back. Now, you know that your little girl is perfectly capable of running the Naboo government but if she's not dressing the part it may deplete the faith the Naboo people have in your little queen. 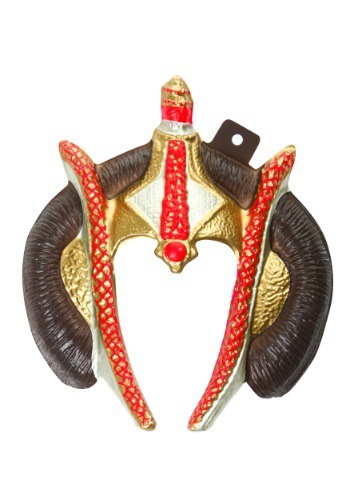 This Economy Queen Amidala Mask has been designed to be the perfect accessory in order to show all of her subjects that she can scale back and still keep her legendary style. Not only will it show her people that she can still look good during even the most trivial of times, but it will also prove to other members of the Galactic Senate she is a worthy and respectable leader. This plastic mask is molded to resemble the Queen's headdress and secures with a string around the back. Add a bit of face paint and a beautiful dress and your illusion will be complete. None of the citizens of Naboo will even question the current economic state of their planet! Standard Size 10.5" x 11.5" 10.5" x 11.5"